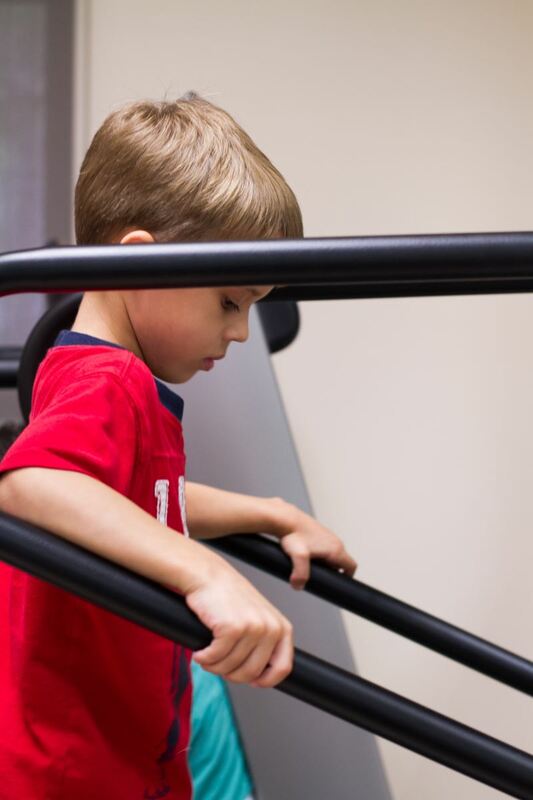 Physical therapy is a critical component of Limb Lengthening and Deformity Correction treatment. Limb lengthening creates special demands and considerations for the patient’s rehabilitation. The goals of therapy are to maintain and increase range-of-motion of joints, promote muscle strengthening, help prevent contractures, and improve strength, mobility, and functional independence. Rehabilitation will usually begin one to two days after surgery in the hospital. This is referred to as the acute rehabilitation, or inpatient rehabilitation. This therapy will be provided by the therapists at St. Mary’s Medical Center. If the patient requires a splint or any other orthotic management, this will usually be provided during the inpatient rehabilitation. Rehabilitation will take place every day during inpatient stay, usually 5 to 7 days. Therapy consists of range-of-motion exercises, pain and edema control, splinting, and functional activities such as transitioning from bed to wheelchair, gait training, and standing exercises. Gait training usually begins on parallel bars and will progress to a walker or crutches after a couple of days. It is important to follow the weight-bearing restrictions established by Dr. Paley. Your therapist will be able to instruct you on gait training within your weight-bearing restrictions. Once discharged from the hospital, outpatient rehabilitation will begin at the Paley Institute’s Rehabilitation Department. The first visit will consist of an evaluation identifying any precautions based on Dr. Paley’s prescription, assessment of pain, active and passive range-of-motion (ROM), strength, mobility, sensation, gait, balance, and coordination. During the first visit the therapist will establish a home therapy program and educate the family on stretches required at home. The patient and their family will be given handouts and videos to ensure proper technique. During lengthening it is crucial that stretches are done outside of formal therapy. The patient will require therapy three times daily, once with the therapist and twice at home. Compliance with the home program will significantly reduce the risk of developing complications. The therapist will also help you establish appropriate goals and what can be realistically expected after surgery. Because therapy occurs daily in most cases, the physical therapist is often the first to notice the early signs of a complication. The goals of physical therapy are to maximize range-of-motion, prevent contractures, and improve strength, mobility, and functional independence. 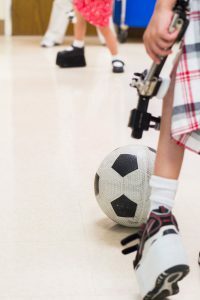 Balance activities should progress towards walking with minimal deviations with assistive device as needed to ensure safety and independence. As the patient improves, more exercises and stretches will be given during sessions. Mobility will also progress as initial pain subsides and strength and endurance are regained. Daily stretches are determined by the surgery and the affected area. It is perfectly normal for the patient to start with good ROM and decrease slightly as lengthening continues. It is important to remember that as the bone continues to grow, increased strain is placed on the muscles and soft tissues, limiting motion. It thus may appear that the patient is doing worse. This is perfectly normal and once consolidation begins, the patient will experience steady and consistent improvements in ROM. That said, ROM must be maintained through lengthening. If a large amount of ROM is lost, lengthening may be prematurely halted as it is not safe to continue. Functionality of the joints will never be sacrificed for length. Many patients will be discharged from the hospital with a splint, a fixator bar, a brace, and/or an orthotic device. It is important to follow all protocols and wear the device as instructed. Many lengthening patients will require a shoe lift in order to assist with gait. In some cases, such as during tibial lengthening and correction, the fixator may be extended to the floor with a special foot plate that will allow the patient to walk on the fixator. Application and adjustments to the foot plate are performed by the orthopedic technologists. If there is a large limb length discrepancy, a special orthotic may be used rather than a shoe lift. Braces and orthotic devices are provided by Falk Prosthetics in Jupiter, FL. If the limb length discrepancy is small, a shoe lift will be prescribed. As lengthening and deformity corrections occur, the shoe lift can be shaved down and adjusted accordingly. The physical therapist will be able to assess this and suggest shoe lift alterations. For more information on the external fixator, see External Fixator Management. Prior to stretches, moist heat is applied and may be coupled with electrical stimulation. Manual techniques to include soft tissue release and joint mobilization prior to stretches will help to decrease the discomfort associated with muscle lengthening, prepare the surrounding structures for stretches, and decrease pain associated with stretching. Careful hand placement by the therapist ensures the maximum comfort and safety. Wearing comfortable clothing that provides access to the affected body parts will make therapy smoother. It is also helpful to bring a walker or assistive device so that the therapist can train in its use and make appropriate height adjustments. It may take longer than you expect to get ready to leave the house or hotel room and to transfer into and out of the car if you are driving, so you may want to allow for extra time to ensure that you receive your full allotted time with the therapist. Physical therapy appointments are scheduled for one hour. Additional therapy time per day may be recommended and scheduled depending on insurance and financial considerations. The evaluation will usually run for an hour and a half as we ask the patients to come in a little early in order to fill out paperwork. If you have any questions or concerns about physical therapy billing or insurance benefits, see Insurance & Billing Information. Some patients may benefit from aquatic therapy in addition to a land therapy program. Aquatic therapy should never be substituted for land therapy, however. Aquatic therapy is cleared by Dr. Paley once the surgical wound has healed, typically seven to ten days after surgery. Aquatic therapy utilizes the same stretches but in a buoyant environment and is particularly helpful in strengthening hip abductors, quadriceps, and the gastroc-soleus. Aquatic therapy is provided by the Rehabilitation Center for Children and Adults in Palm Beach, FL. Aquatic therapy counts as a separate physical therapy session in addition to land therapy. For that reason, it is typically an added expense and not many families can afford to attend daily aquatic therapy. Some families will attend aquatic therapy for one or two visits and receive home instruction. They will then perform the stretches themselves in the hotel pool. Most patients find it helpful to have hot packs and cold packs that can be used at home to relieve pain and prepare for exercise. You can find these at local pharmacies or bring them from home. Some innovative patients have even made hot packs of bean bags filled with lentils and rice that can be warmed up in a microwave. Hot packs should not be used until your therapist begins to use them in therapy, as heat can increase swelling if used too soon. Please note that hot packs should only be used twenty minutes at a time and three to four times per day. Heat is best applied before movement. Cold can be helpful afterward or when the patient is experiencing pain. Not everyone enjoys the feeling of cold packs. In general, there is no need to force using one and it should only be used if it is palliative. Please ask your therapist before applying cold packs at home. Many patients have found home electrical stimulation units to be extremely helpful in pain and spasm management. Your therapist will help to determine if this will be beneficial and can help set you up with an appropriate unit. The physical therapy department orders its electrical stimulation units from EMPI. Home exercises will be given to the patient and family and they will be trained on the home therapy. It may be challenging and daunting to perform the home program, but it is absolutely critical and will improve the tolerance to each therapy session and the overall outcome of the procedure. As a parent performing the home exercises, it may feel like you are hurting your child during the stretches, but keep in mind you would be hurting them more in the long run by not following through at home. Please inform your therapist if you having difficulty with any aspect of the home program so he or she can assist. This is a team effort and all members of the team are equally important. After the patient has concluded lengthening or deformity correction, Dr. Paley will usually clear them to return home. In most cases, physical therapy will continue at home, although the frequency can usually decrease at this time, as long as functional goals and ROM are progressing. In order to assist home town therapists, the Rehabilitation Department supplies each patient with a discharge packet, to include all their medical records including hospital and surgical notes, therapy evaluation and plan of care, therapy protocols and video recordings of the pertinent stretches. The Rehabilitation Department is committed to assisting all patients in their rehabilitation, even after they return home. If you or your hometown therapist has any questions or concerns, please contact us at 561.844.7878.